The Catawba Indian Nation want to build a casino resort in Kings Mountain, North Carolina, a small suburban city about 30 miles west of Charlotte near the stateline with South Carolina. Native American tribes require federal recognition and federal approval before building a casino under the Indian Gaming Regulation Act. The Catawba received federal recognition in 1993 and is the only federally recognized tribe in South Carolina. In September 2013 the Catawba tribe took its first major step towards building a casino when it filed an application with the Federal Bureau of Indian Affairs for a land trust and casino rights on 16 acres near Kings Mountain, North Carolina. The ancestral homeland of the Catawba stretched from South Carolina, through North Carolina and into southern Virginia. The initial plan to build a resort casino in Kings Mountain, North Carolina was announced by Chief Bill Harris at a tribal meeting on September 7, 2013. Project: $600 million casino complex that will create 5,000 construction jobs and generate $300 million of annual economic activity. Location: The casino site is 16 acres in the northwestern quadrant of the intersection of Kings Mountain Blvd. and I-85 (Exit 5) in Kings Mountain, NC. Casino Name: The tribe will partner with a major casino brand for the naming. Restaurants & Stores: Will be announced. Entertainment Center: Full concert and event venue. Since the Catawba Indian Nation filed its application in 2013, there have been five years of delays and no action by the Bureau of Indian Affairs (BIA). This prompted South Carolina Senator Lindsey Graham to introduce the bill in March 2019 to bypass the BIA and approve the application by an act of Congress. 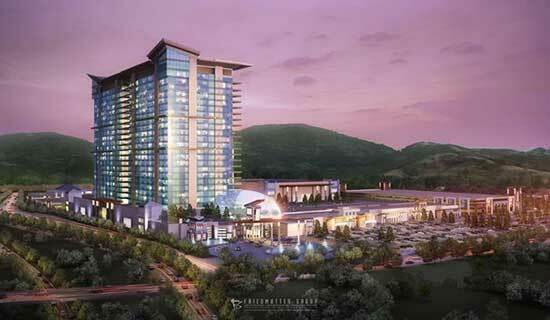 Read the news story, "New Hope for Catawba Casino at Kings Mountain NC". The Catawba plan raised immediate opposition from the Eastern Band of the Cherokee Indians, who called it a "land grab." The tribe operates Harrah's Cherokee Casino and Harrah's Cherokee Valley River Hotel & Casino, both in Cherokee County, North Carolina. A letter written by House Speaker Thom Tillis and signed by a hundred House members sent to the United States Secretary of the Interior requesting the Catawba trust application be denied. The Haywood County Board of Commissioners passed a resolution Apr 3, 2019 opposing the Catawba casino proposed in Cleveland County. Haywood County is the first of seven western counties to respond to a request from the Eastern Band of the Cherokee Indians to oppose the Catawba casino. The type of gaming is yet to be determined. If the casino is approved by the federal government, the Catawba tribe will have to negotiate a compact with the North Carolina state government to establish the type and number of games. The number of restaurants and their cuisines will be announced at a later date. A full entertainment center will be built to host concerts and other special events. There will be one and maybe two hotels on the property. After five years of no action by the Bureau of Indian Affairs on the casino application submitted in 2013 by the Catawba Indian Nation, Sen. Linsay Graham (R-SC) has introduced a Senate bill to bypass the agency and approve placing the Catawba casino site into federal trust by an act of Congress. The two North Carolina senators, Thom Tillis and Richard Burr, both co-sponsor the bill. "The Catawba Nation has been treated unfairly by the federal government, and our legislation rights that wrong," said Sen. Graham. "I hope this legislation will be quickly passed through the Congress and signed into law so we can once and for all bring resolution to this issue." Within hours of the bill's introduction, the Eastern Band of Cherokee Indians issued a statement of opposition. The Eastern Band of Cherokee Indians is the only federally-recognized tribe in North Caolina. "The Eastern Band of Cherokee Indians' (EBCI) centuries-long North Carolina tradition has created a lasting partnership with the state to provide a strong future for generations through health care, education and business. While the tribe respects and encourages progress for other Native American communities, including South Carolina's Catawba Indian Nation, the recent filing of a bill in the US Senate to give North Carolina land to the South Carolina tribe for an off-reservation casino is nothing more than a modern day land grab by the federal government of Cherokee aboriginal lands. This action circumvents the existing process for the Catawba Indian Nation to acquire lands in South Carolina, is unprecedented in US history, and a federal government bully tactic that should not be part of modern governing. We encourage the Catawba Indian Nation to go through the same process in their home state of South Carolina that the EBCI did in North Carolina to build their business - to develop their on-reservation economy as it should be - in their community. Doing it the right way will ensure they are able to take care of their members and support their local community as we've done for years in North Carolina." Development plans are moving forward for the new Kings Mountain casino. 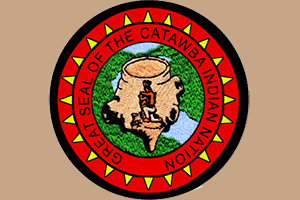 The Catawba Indian Nation are the owners of the casino. The tribe is looking for a nationally recognized casino brand company to partner with them. A possible partnership could be with Hard Rock International. The Hard Rock brand is owned by the Seminole Tribe of Florida. A partnership between the two could bring additional support from political leaders for the Kings Mountain casino. If a partnership is able to be formed, the Catawba Indian Nation will be able to provide a proven and regulated structure to their project. The Eastern Band of Cherokee Indians are the operators of the only other tribal casino in the state. They own the Harrah's Cherokee. The Catawba Indian tribe has proposed a new casino near Kings Mountain. The proposal has caused a controversy. The Kings Mountain Awareness Group has challenged the impact that the casino will have on the area. Meetings have been organized by the group for both business owners and the community. On July 17 another meeting will be held with a speaker from D.C. that will talk about the negative affects of small communities and casinos. The group also plans to attend future Kings Mountain City Council meetings. As well as Cleveland County Board of Commissioners. The group intends to speak about their concerns of the Kings Mountain casino at the meetings. They are also hopeful to have local politicians change their support for the casino. The Catawba Indian Nation, located in South Carolina, is proposing a new casino to be built. However, the casino would be built just over the North Carolina border. Previously the tribe has been trying to build a casino in South Carolina. The state has been opposed the project whenever submitted. Lawmakers for North Carolina are also not in favor of the casino project. It is believed the Catawba Indian Nation project is approved, then other tribes from out of state will also try to build their casino there. The tribe believes that the casino project will create many new jobs for the area. As well as earn the state and local economy millions in gaming revenues.